I bought a new stick blender when I was at Costco the other day, so I’ve been on a smoothie making kick. 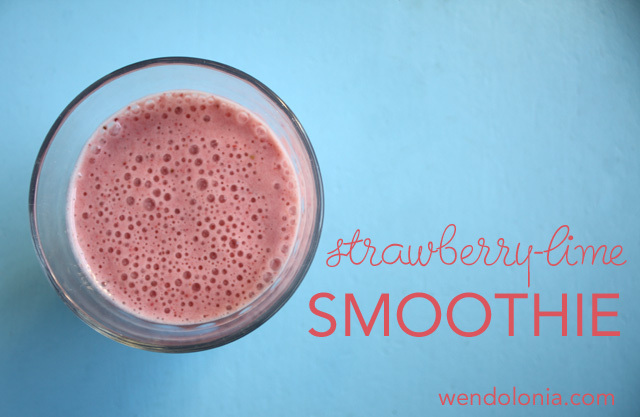 I love smoothies because they’re packed with healthy ingredients and they are a fun way to get a bunch of fruit into my kids. Normally when I make smoothies I just combine fruit, yogurt and milk willy-nilly depending on what we have in the fridge, but I noticed that my older son Wyatt hasn’t been drinking them when I do this. When I asked him what kind of smoothie he thought he like he told me that his favorite type of smoothie is the strawberry-lime flavor he gets at Jamba Juice. Thaw strawberries slightly. Combine strawberries, milk and yogurt. Blend until completely pureed in with a stick blender, regular blender or food processor. Add in lime juice and chia or flax seeds (if using) and blend again until thoroughly combined. Makes 2 small smoothies or one big honkin’ one! Success! Though this didn’t really resemble the Jamba Juice smoothie I was emulating very much the flavors was close enough to entice Wyatt. In fact, both kids loved these and sucked them down so fast they got ice cream headaches. I made a second batch so I could have some too and they asked for more.